Ctrip’s results will likely show stronger gains in mobile booking than we’ve previously seen from Chinese booking sites. Ctrip.com International Ltd. led gains among Chinese stocks trading in the U.S. as the online travel agency forecast a second-quarter revenue gain of as much as 35 percent after exceeding estimates for the period ended in March. The Bloomberg index of the most-traded Chinese stocks in the U.S. rose 1.2 percent to 99.36 at 1:14 p.m. in New York, heading for its first gain in four days. Ctrip rallied the most since April 8. Qihoo 360 Technology Co., the country’s second- biggest online search engine, fell 0.4 percent. China Telecom Corp Ltd. advanced to the highest since November. Ctrip said second-quarter sales will range between $263.7 million and $273.8 million. The average estimate of nine analysts surveyed by Bloomberg was $265.1 million. The company has been investing in its rivals to avoid price wars and preserve profit margin. The positive earnings report is helping offset a recent drop in Chinese Internet stocks fueled by concern valuations were too rich, said Cheng Cheng, an analyst at Pacific Crest Securities LLC. Ctrip reported revenue of $254.5 million during the first quarter, according to a May 7 statement. The average estimate of 10 analysts surveyed by Bloomberg was $244.6 million. 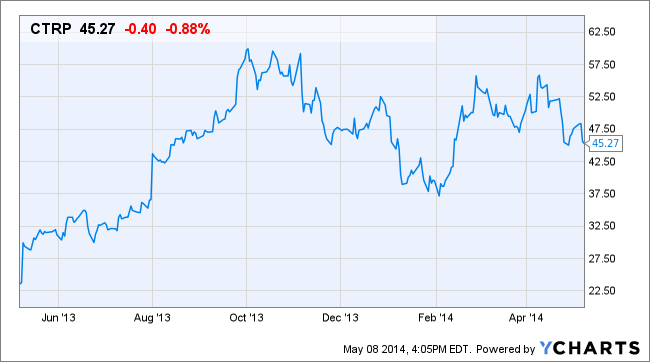 Ctrip rallied 4.6 percent to $47.75. Qihoo fell for the fourth day, slipping to $77.82. The iShares China Large-Cap ETF, the largest Chinese exchange-traded fund in the U.S., rose 0.7 percent to $34.86. The Hang Seng China Enterprises Index of mainland stocks traded in Hong Kong gained 0.8 percent to 9,734.97. The Shanghai Composite Index increased 0.3 percent to 2,015.274. To contact the reporter on this story: Gabrielle Coppola in New York at gcoppola@bloomberg.net. To contact the editors responsible for this story: Nikolaj Gammeltoft at ngammeltoft@bloomberg.net.